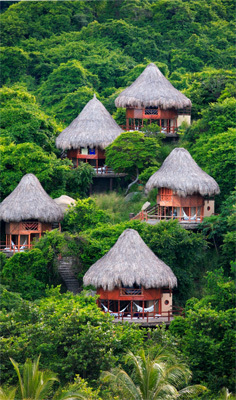 For the most comfortable accommodation in Tayrona National Park, Ecohabs Tayrona is your best choice. Located on the beautiful Cañaveral beach, travellers can enjoy peace and privacy in cozy bungalows good for up to 4 persons, in one of the best places in all Colombia. The bungalows are built with native wood and high roofs covered in palm leaves, a design inspired by the ancient Tayrona tribes. 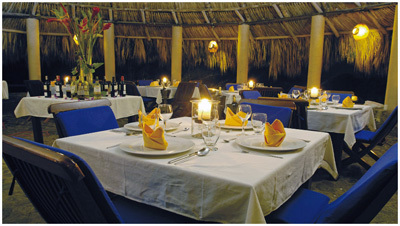 Each bungalow provides a great view of the Caribbean Sea and the green landscape. From Ecohabs Tayrona guests may easily explore the rest of Tayrona National Park, choosing from a variety of activites such as bird watching, trekking to the ancient ruins of the Tayrona tribes, or simply taking long walks along the different beaches of the park, as Arrecifes, Cabo San Juan del Guía, La Piscina, etc. Travel to Tayrona National Park will be your best experiencie in this 2016. Ecohabs Tayrona has a spa where you can enjoy various treatments for your face and body, all for your comfort and relaxation in a privilegido environment. Here are some of the treatments. Enjoy your stay with Spa Tayrona. Ololl. With olive oil to relax the body (1:30 a.m.) 203,000 COP If you wish, we can send you more information on treatments. You can organize your tours from Ecohabs and know all the Tayrona Park, visit the archaeological ruins of the Tayrona, the city of Santa Marta, Sierra Nevada. Here are some of our Tours, choose the one you like and enjoy nature. Cabo San Juan Beach. A path through the forest from Canaveral, Reefs and then to the pool, Cabo San Juan and nudist beach. Sierra Nevada ATV. archaeological sites, waterfalls and ancient roads of Tayronaka. Tour Playa Cristal. A path through the woods and beaches. If you wish we can send the list of Tours. For souvenir shopping, Ecotienda (Ecostore), sells locally made products that support the livelihood of neighbouring communities. You can also use the jacuzzi, one in the beach and other one in the mountain and the hanging bed without additional cost. You can also ask for decoration with flowers, rose petals and ballons (75,000 pesos), have a bottle of wine (90,000 pesos), or arrange a romantic dinner in the beach jacuzzi with bottle of wine (320,000 pesos). As you enter to Tayrona National Park you are inside a jungle, natural reserve, so it is usual to find animals or insects in the area or the hotel. It's possible to enter the Tayrona Park at any time if you have a reservation. WiFi Conection - the hotel is far from the city, so the wifi is not the best and sometimes is totally blocked. When there are 4 persons in the same hut there is a double bed and two additional single beds. In small ecohab there is a double bed not changeable. The price for ecohabs big and small is the same. Created in 1964, is a vast 15,000-acre nature reserve along the Caribbean coast northeast of Santa Marta. 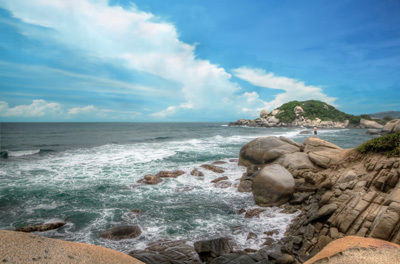 It is home of Santa Marta's most beautiful beaches and a wide range of Colombia's native flora and fauna. Apart from the lush vegetation, the park is rich in cultural history, as it was home to the ancient Tayrona tribes who roamed the lands way before the arrival of the Spanish colonizers. 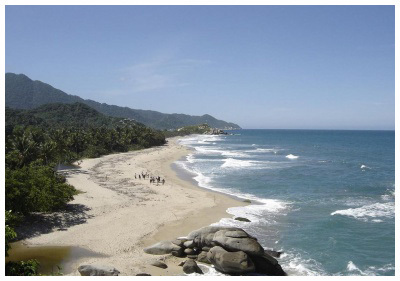 TAYRONA NATIONAL PARK TICKETS: To enter Tayrona Park it's needed to pay the park fee. 24,000 for colombians over 25 years, 53,500 for foreigners and 18,000 pesos for Colombians under 25 years, this prices will change during high season. Not included in the price. Late check-out depends upon availability, the hotel will try to satisfy your special needs. 1. Cancellations or changes received between 15 and 5 days before the check-in will have a charge of the first night. 4 days before: charge of 50% of the total amount. 3 days before: charge of 75% of the total amount. 1 day before: charge of the 100% of the total amount. 3.Cancellations or change received between 4 and one day before the check-in for one night reservations will have a charge of the 100% of the total amount. 4.In case of cancellations without any penalty it will be charged a 10% of the total amount in concept of administrative expenses of the agency. Refund: The refund will be apply according to the terms in the cancellation policies. Once started the travel, the services included and not used won't be refunded, unless the cancellation is verified by illness justified by the EPS, medical certificate for foreigners.